"Promise me something - that we'll remain a secret, forever." GKids has released a new trailer for Studio Ghibli's When Marnie Was There, the studio's last feature film for the time being that opened in Japan last year. 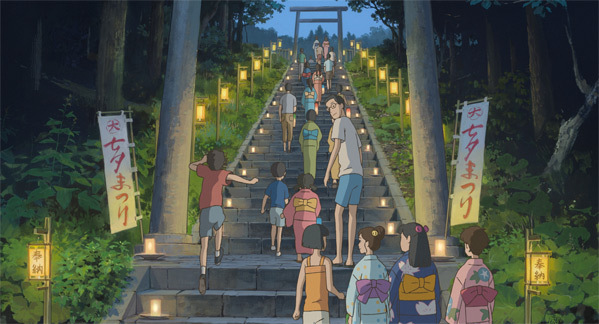 From Hiromasa Yonebayashi, director of Secret World of Arrietty, based on Joan G. Robinson's children's book, When Marnie Was There is a tender, beautiful ghost story of friendship and understanding. The English version of the film (which this is a trailer for) comes with voices from Hailee Steinfeld, Kiernan Shipka, John C. Reilly, Vanessa Williams, Geena Davis, Kathy Bates, Ellen Burstyn, Catherine O’Hara, Grey Griffin, Ava Acres and Raini Roodriguez. I still recommend the Japanese version, but both will be available. I recently saw this film and it's quite charming, but not as fantastic as any of Ghibli's past work. Take a look. Adapted from Joan G. Robinson's children's novel When Marnie Was There (or Omoide no Marnie), it's a coming-of-age story about a young girl that befriends another girl named Marnie, who just so happens to be a ghost. The book is said to have a "special place" on Hayao Miyazaki's 50 Recommended Children's Books list (in full here). Ghibli usually adapts their animated movies directly from children's stories or fables or classic stories from Japanese folk lore. Directing is Yonebayashi Hiromasa (Arriety) from a screenplay co-written by Niwa Keiko (From Up on Poppy Hill, Ocean Waves) and Ando Masahi (character designer on Spirited Away, Princess Mononoke). GKids will release When Marnie Was There in limited US theaters starting May 22nd this summer, expanding wider from there. For more details on the release - see GKids. THE SECRET WORLD OF ARRIETTY was pretty fantastic. I know it didn't get a lot of love, but I thoroughly enjoyed it. I am happy they gave its director another shot. This looks like a good film to close on for Studio Ghibli. I know most fans would have liked another shinto heavy flick, but this one looks like it is striking a good mix. I absolutely loved Arrietty. From Up On Poppy Hill on the other hand... was a bit of a snoozefest unfortunately. Still need to see The Wind Rises. What's GKids? They're not distributed here by Disney any more?